Antonio Ramirez, who was aboard a Hornblower Cruise on Thursday, snapped this photo of the dolphins swimming in a "super mega-pod." Thousands of dolphins spanning across seven miles of ocean were sighted off the coast of San Diego on Thursday, a boat captain told NBC 7 San Diego. Capt. Joe Dutra of Hornblower Cruises said he saw a “super mega-pod” of common dolphins Thursday around noon while he was on his daily tour. He said the pod was more than seven miles long and five miles wide. 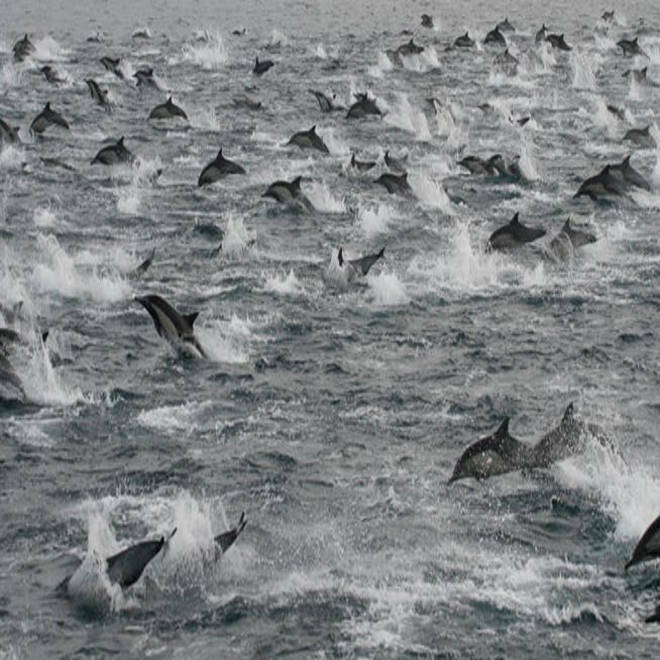 It's likely the mega-pod of dolphins were following food, such as sardines or herring. But whatever the reason they congregated off the coast of California, scientists say there's no doubt they were communicating with one another. NBC's Diana Alvear reports. Dutra said the boat tour followed the pod for more than an hour and said he’s never seen anything like it. “When you see something that is honestly truly beyond belief,” the captain said. Guests aboard the boat started screaming and pointing when they first saw the school of adult and juvenile common dolphins. Dutra estimated there were about 100,000 dolphins swimming in the area. Whale and dolphin watching tours have done particularly well this year, with dozens of animal sightings reported. Marine mammal expert Sarah Wilkin said the reason the large pod might be there is because there’s plenty of food in the area, including sardines, herring and squid. “They’re attracted to kind of the same thing, they might wind up in the same place,” she said. Though dolphins typically travel in groups of 200 or less, Wilkin said “super-pods” are not unheard of. Dutra, who’s been boating for decades, said he felt lucky to enjoy such a rare phenomenon.